J.B. Collitt Engineering Pty. 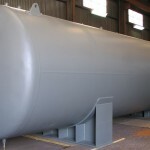 Ltd. was established in 1952 and is a leading Australian manufacturer of Tanks, Pressure Vessels and Boiler Flue Pipes to the Plumbing and Mechanical Services industries. We have extensive experience in all forms of metal fabrication and welding. We specialise in Copper, Stainless Steel, Mild Steel, Boiler Plate, Aluminium & Galvanised Iron. We are a member of ASSDA (Australian Stainless Steel Development Association) and are committed to supplying high quality work to our customers.